The report from analyst firm Strategy Analytics estimates Apple shipped 12 million iPhones within the U.S. during the third quarter of 2017, down from the estimated 13 million units shipped in the same period last year. Closest rival Samsung slightly narrowed Apple's lead further, with an estimated 9.9 million units shipped, up from 9.7 million for Q3 2016. LG improved its third-place ranking in the report from 6.5 million to 6.8 million, with ZTE also seeing an increase from 3.6 million to 4.6 million. Motorola is noted as seeing the biggest year-on-year change of the top five manufacturers, almost doubling the 1.1 million from Q3 2016 to 2.1 million units in 2017. "Demand for the new iPhone 8 portfolio was mixed," Strategy Analytics Executive Director Neil Mawson suggests as one reason behind the slight shipment drop. Mawson also suggested "some Apple fans delayed purchases" of the iPhone, opting instead to wait for the release of the iPhone X. Due to the later release, sales of the iPhone X would not have been counted towards Apple's shipment total, but is likely to make a significant impact to Apple's sales for the following quarter. Samsung's fortunes are said to have been helped by continued sales of the Galaxy S8, which "performed relatively well in the high-tier," along with high sales of the A5 and other models in the mid-tier marketplace. LG benefited from an expanded retail presence at major operators this year, while ZTE is said to be experiencing strong demand in the lower-cost prepaid market, eroding market share from rivals TCL-Alcatel and Blu. Notably, when taking into account all vendors including those outside the top five in the report, total smartphone shipments for the period were in fact down from last year's total, with the market said to have contracted by 1.5 percent year-over-year. 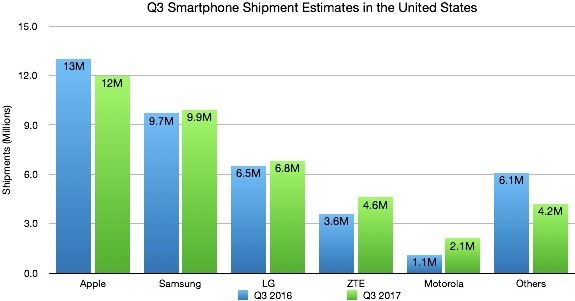 In Q3 2017, an estimated 39.5 million smartphones were shipped in the U.S, a drop of approximately 0.6 million from the 40.1 million reportedly shipped in Q3 2016. 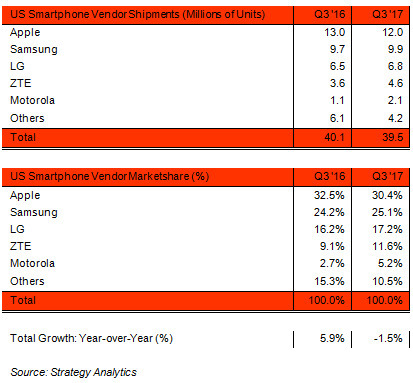 In terms of market share, Apple saw its lead shrink from 32.5 percent in Q3 2016 to 30.4 percent in Q3 2017. Samsung gained 0.9 percent of the market, bringing it up to 25.1 percent, while LG, ZTE, and Motorola all saw market share increases to 17.2 percent, 11.6 percent, and 5.2 percent respectively.